When we create TSQL objects such as Stored Procedure, Function etc., we put comments inside our code so we do not have to dig through code later to understand it when it comes to make some changes. By putting comments we make sure if any other developer in our team needs to understand the program to make changes or execute,He/She can use these comments as document and understand quickly. It is good practice to include comments even you write your code in any programming language. In SSIS Package, Annotations is provided that can be used to put our comments inside SSIS Package. 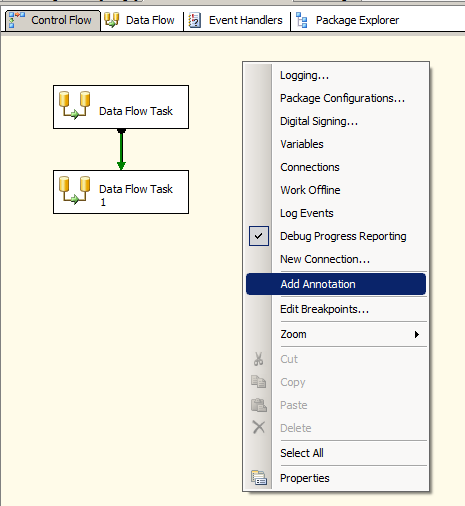 Annotations are available in Control Flow, Data Flow and Event Handler design surfaces of SSIS Designer. Let's start writing our comments about the SSIS Package those can help us and other developer to understand this Package quickly. After writing first line of comment we want to go to next line. Let's hit Enter key. Only Enter is not going to take you to next line if you are using BIDS. Press Ctrl and then hit Enter. It will take you to next line. If we are using SQL Server Data Tools (SSDT) then Enter key will take you to next line. Fig 5: Adding Annotation when using SSDT. If you try to select the comments you have written and copy, The copy option is grayed out. Select the text and then press Ctrl+C to copy the text. SSIS - What Is ETL (Extract, Transform, Load) ?